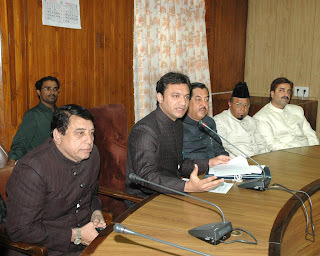 MiM Floor Leader Akbaruddin Owaisi along with MiM Party Legislators addressing Mediapersons in Assembly. 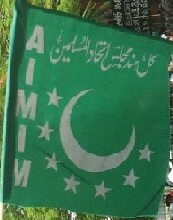 Hyderabad , Assembly : The Majlis e Ittehadul Muslimeen (MIM) expressed strong displeasure over the government not implementing the reservations to Muslim minorities in the allotment of housing under housing board and other government scheme. Home Minister K Jana Reddy reacting to MIM Floor Leader plea said that government would now onward would implement the reservations to minorities in weaker section housing. 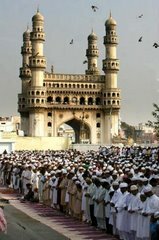 Participating on the discussion on bill to amend housing board, MIM Floor Leader Akbaruddin Owaisi said that state government has issued orders for providing 20 percent reservations to Muslims in housing, unfortunately during the Congress 2 and half years period, the minorities were never given their true share. Mr Akbaruddin Owaisi said that Joint venture would never helpful and always been the failures. He stated that government has introduced the bill hastily and wanted the bill be withdrawn. He also stated that when ever bill introduced minister concerned would brief about the benefits about the bill but here the Minister did not briefed. Reacting on this Minister said that being mentioned in the bill i have avoided repeating the same. u are great leader.. mr modi..